STOP ME if you've heard this before, writes Jordan Roy-Byrne at TheDailyGold. But precious metals disappointed again. The miners were leading the metals but the metals broke down from bear flag patterns and that took the miners lower, suggesting an interim top is in place. The technicals suggest weakness could be ahead for the sector but the fundamentals are finally turning bullish. Before we get to fundamentals, let's look at the technicals. The weekly candle chart of GDX and GDXJ is below. 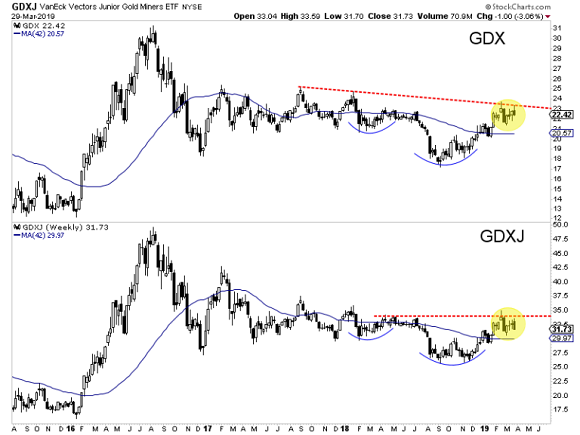 After mid-March's failure to break weekly resistance, GDX now has resistance at $23 and GDXJ has resistance at $34. The near-term trend is probably lower but if the Fed is going to cut rates later this year, I'd expect the miners to eventually make a higher low which could also look like the right shoulder of an irregular head and shoulders bottoming pattern. 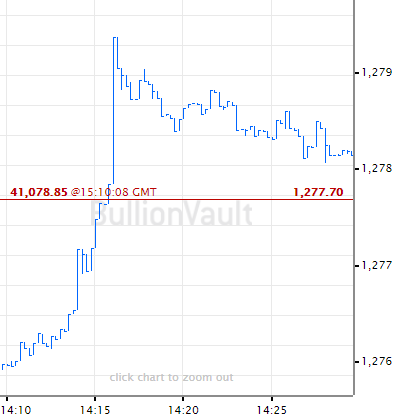 As we have noted, it wasn't until after the first rate cut (in the previous two occurrences) that precious metals began to outperform. The chart below shows the pattern that leads to strong performance in gold stocks. The 2-year yield starts to decline, the Fed pauses, the yield curve steepens, the Fed cuts and then gold stocks perform. 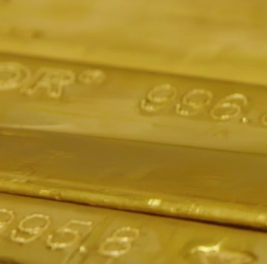 With the current context and history, we can make the case that gold stocks and Gold will not officially move into a bull market until the Fed makes its first rate cut. Fed funds futures are now essentially discounting a rate cut by December and showing nearly a 30% chance of two rate cuts by January 2020. 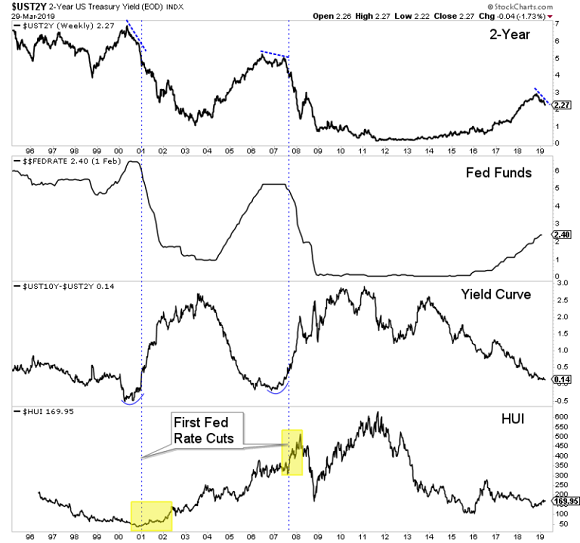 Bonds are overbought (and yields are oversold) and so these markets could see a counter trend move which would align with weakness in precious metals. 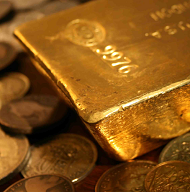 However, precious metals bulls should not be dissuaded by weakness as a rate cut is likely coming within the next 12 months and probably sooner. 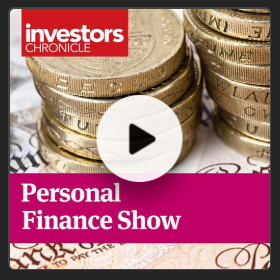 The weeks and months ahead could prove to be an especially opportune time to position in advance of the first cut and a confirmed new bull market in gold stocks.